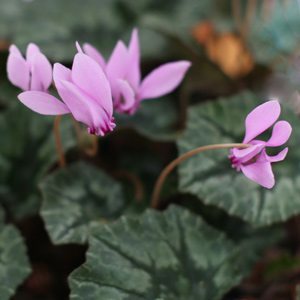 The wonderful world of Cyclamen provide gardeners with a hardy group of plants, very attractive flowers and many with excellent foliage as well. This is a varied group of plants, some preferring shade, others growing well in full sun. The plants that we see at the florists are just one part of this fascinating genus. Generally Cyclamen care is easy, we provide full notes separately. The varieties available for sale include the popular Cyclamen coum and hederifolium amongst a number of other species. Often grown as indoor plants, they are actually a wonderful garden plant when grown in the right conditions. For some this will be dappled shade, while other species appreciate full sun. Although they are promoted for the flowers, many species also have excellent foliage and will form a good dense clump over time. Most species can be left for many years in the garden, a little fertiliser in spring and perhaps some water during long dry spells when they are in active growth is all that they require. They will multiply and be divided if they become to crowded. Most species are shade lovers, a few are sun lovers. some are spring flowering species such as C. alpinum, C. coum, elegans and persicum, others are autumn flowering such as C. cilicium, graecum and hederifolium. This a bit of an oddity in that it likes to grow in a hot dry position. The corms take many years to establish but it is well worth the wait. This is a species noted for the beauty of its leaf markings. This is the most common form grown commercially, C. persicum is the variety most often sold in large nurseries and florists, sometimes called the ‘florists cyclamen’). Always available in pots and often grown indoors. C. persicum does not like frosts and does not like cold weather. Blooming from winter through to spring C. coum is a tough plant and can be left to naturalize in the garden, not afraid of cold weather this species grows well in dappled shade (a great woodland plant). C. Coum requires a well drained soil and a little mulch in summer. Another great woodland plant from originally from Europe (France, Bulgaria through to Crete). C. hederifolium will grow in full sun (protect from hot afternoon sun in Australia) and enjoys a position beneath deciduous trees growing in the decomposing leaves (leaf mould or leaf litter). C. africanum, creticum, balearicum, cilicium, cyprium, intaminatum, libanoticum, mirabile, parviflorum, pseudibericum, purpurascens, somalense and trochopteranthum.